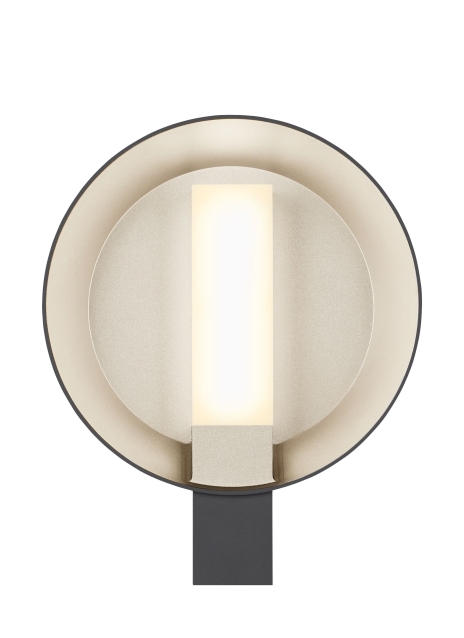 The Refuge Round LED outdoor light from Tech Lighting exudes clean contemporary styling while projecting a warm, multidimensional glow indoors or out. The smart combination of a semi-enclosed, one-piece round metal shade and a contrasting elongated rectangular molded glass diffuser create an alluring visual effect sure to add a beautiful decorative element to your exterior façade that is equally functional. Two size options allow this outdoor light to be adapted to a variety of outdoor lighting applications such as front door lighting, entry lighting and garage lighting and each are fully dimmable for creating the desired ambiance indoors or out. Die-cast aluminum structure, marine-grade powder coat finish, and stainless steel hardware for robust durability in harsh elements. Wet listed, IP65 (International Protection rating indicating resistance to dust and water).